Until now surgeons haven’t had a special tool for safely removing cement from and sculpting cement around bone during total hip and knee replacement surgeries. They’ve had to rely on less precise methods or using metal tools that can scratch the prosthesis. These micro-scratches can compromise the strength and durability of the prosthesis with impact on positive outcomes long-term. Nurses have had to deal with the instruments used this way by trying to clean off the cement before it dries completely or trying to chip it away once it has set. This is both time consuming and can damage the instrument. We have real solutions to these problems - the Whitney Medical Solutions' No-Scratch™ Whitney Curette™. With a family of four curettes, we have the right tool for the removal of bone cement job. The safe and easy-to-use, disposable No-Scratch™ Whitney Curette™ is perfect for quickly applying, manipulating and removing bone cement during hip and knee replacement surgery. The No-Scratch™ Whitney Curette™ is made of sturdy plastic, reducing the risk of damaging the prosthesis with metal instruments. Which No-Scratch Curette Is Right For Your Surgery? 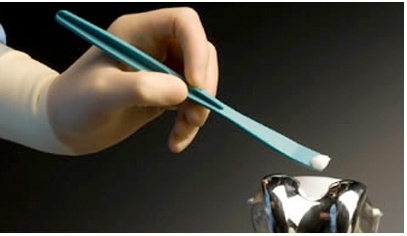 Our one-time use curettes are economical and save time. 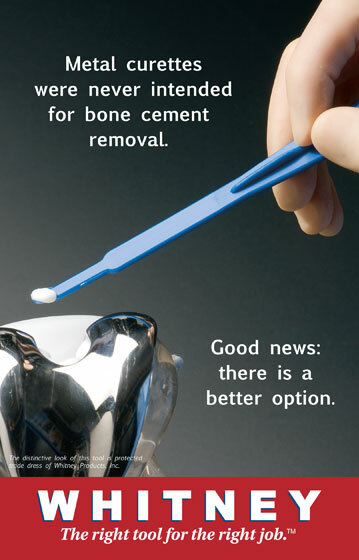 No need to clean or scrape dried cement from instruments. The disposable No-Scratch™ Whitney Curette™ means no re-sterilizing or re-stocking. Applies, manipulates, or removes cement with finger tip precision. Even a micro-scratch on an implant caused by a metal instrument can compromise the long-term success of the procedure. By comparison, the cost of a single, surgical revision far exceeds the cost of a single-use No-Scratch™ Whitney Curette™.